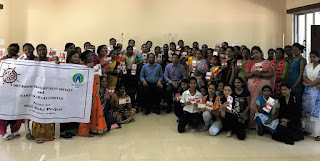 01-April-2019, Mumbai: The Don Bosco Development Society (DBDS), Mumbai organized the event of linking 86 slum women to various financial products. Under the financial literacy initiative the poor and low income group families are being linked to various saving and investment schemes of government of India. The programme began with the welcome address by Fr Rolvin D’Mello (Executive Director – DBDS). In his speech he placed on record his sincere thanks to Mahanagar Gas Limited (MGL) for supporting this project. 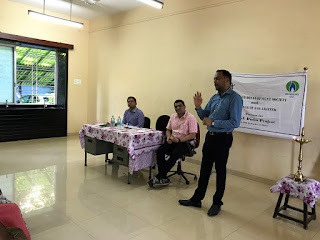 Mr Nishant Sinha (Manager CSR - MGL) was the chief guest for the event. In his speech he highlighted the long term benefits of small saving and meeting financial goals. Mr Vinod Negi (Asst. Manager CSR – MGL) was the guest of honour. In his speech, he spoke about MGL and its philosophy behind doing CSR. For linking the women to government schemes, DBDS staff did the entire ground work such as liaison with the post office department, completing application form, submission of files and coordinating and follow-up with the government agencies. In past one month this has helped 86 slum women to access various government schemes, insurances and subsidies. The program ended with a vote of thanks and sumptuous snacks for all.